Karva Chauth is a one-day festival celebrated by Nort Indian married ladies for the health, well-being and long life of their husbands. 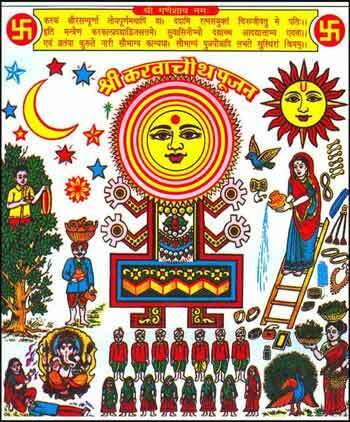 The fast is observed from sunrise to moonrise on the fourth day after the full moon, in the Hindu lunar calendar month of Kartik. Nowadays, unmarried women observe the fast for their fiances or for a good alliance! The festival’s origins may have been the military campaigns and long-distance travel undertaken by men after the end of tthe rainy season. Women began to observe the fast to pray for the safety of their husbands. The festival coincides with the wheat-sowing time and big earthen pots that are used to store wheat are also called karvas. The fast may also have begun as a prayer for a good harvest in this predominantly wheat-eating region of the north. Karva also means diya, the small earthen oil-lamp and chauth means ‘fourth’. Seema Bhargav says, “The ‘karva’ for us Gaur Brahmins refers to the spouted lota or pot from which water is poured. “It is a festival for women. We have to get up early before sunrise and an important part of our vrath is that we have eat and drink something which is called ‘sargi’ and our mother-in-law gives it to us along with gifts. The fast is broken at night”. Women begin to prepare for Karva Chauth a few days ahead and buy cosmetics (shringar), traditional adornments or jewellery and puja items like the karwa lamps, matthi (the savoury puri), henna and decorated puja thalis that are now available readymade. Bazaars in the north take on a festive look as shopkeepers display the Karva Chauth objects. Lily Madhok is getting ready to look after her clients who will be streaming into her ‘Salon 2000-Beauty Launch’ for beauty treatments and for applying Mehendi. “The ‘karva’ is an earthen pot in which water is placed. We dress up for this occasion and wear red, orange and brightly embellished saris and jewels. 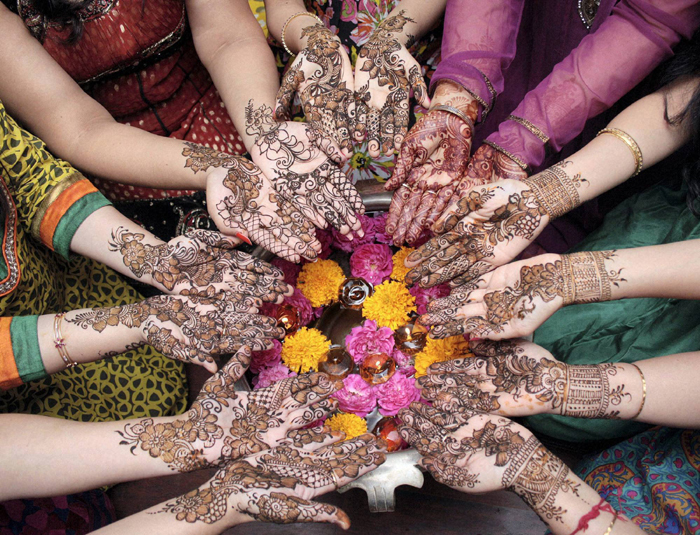 In Punjabis it is a community effort and six women sit in a circle and relate the story of Karva Chauth and pass a plate full of sweets, dry fruits, , money. A coconut and pomegranate are compulsory on this plate. We sing a song with seven verses and the plate is passed around for each verse”. The first six verses of the Karva Chauth song describes some of the activities that are taboo during the fast and the seventh describes the lifting of the restrictions after the fast is over. Forbidden activities include weaving cloth, pleading with or attempting to please anyone and awakening anyone who is asleep. Lily continues, “For the first Karva Chauth after marriage, the mother-in-law gives a basket full of matri, the salty puri to the bride and this is then distributed to the mohalla. New clothes are exchanged between the mother-in-law and daughter-in-law . The fast is broken with aglass of water given by our husband“. The day is spent meeting friends and relatives. Painted clay pots filled with bangles, ribbons, home-made candy, cosmetics and cloth like embroidered handkerchiefs are exchanged. Parents send gifts to their married daughters and their children. “In Rajasthan, among Marwaris”, Urmila Agarwal says, “we dress up and wear red clothes and jewellery. After a day without water and food, we wait to see the moon through a sieve. All the shubh symbols of being a suhagan, married woman, are compulsorily worn for this fast”. Once the moon is visible, a fasting woman, with her husband nearby, sees the reflection of the moon in a vessel filled with water, through a sieve, or through the cloth of a dupatta. Water is offered (arka) to the moon to secure its blessings. She then turns to her husband and views his face indirectly in the same manner. Nowadays, many husbands are also keeping the fast for their wives in keeping with the concept of gender equality. Veervati was the only sister of seven loving brothers. She spent her first Karva Chauth as a married woman in her parents’ house. She began a strict fast after sunrise but, by evening, was desperately waiting for the moonrise as she suffered severe thirst and hunger. Her seven brothers could not bear to see their sister’s distress. They palced a mirror on a pipal tree that made it look as though the moon had risen and the sister broke her fast. The moment she ate, word came that her husband, was dead. Heartbroken, she wept through the night until her ‘pativrata’ power made Goddess Parvathi to appear and when the queen explained her distress, the Goddess revealed how the queen had been tricked by her brothers and instructed her to repeat the Karva Chauth fast with complete devotion. When Veervati repeated the fast, Yama was forced to restore her husband to life. In a variant of this story, the brothers build a massive fire behind a mountain instead and trick their sister by convincing her that the glow is the moon. She breaks her fast and word arrives that her beloved husband has died. She runs to her husband’s house that is far away and meets Shiva-Parvathi. Parvati reveals the trickery to her, cuts her own little finger and gives the wife a few drops of her holy blood which the wife sprinkles on her dead husband and makes him come back to life. This entry was posted in Heritage, Spirituality, Women and tagged chauth, earthen pot, fasting, fourth day moon, Karva, karva chauth, moon, Veeravati. Bookmark the permalink. Your bhabi kept the vrath once in Delhi without my knowing about it. She simply joined our neighbour’s lady members and learnt all about it from them. After that, I had put a stop to her keeping it. While it is indeed a good tradition, it is impractical in today’s city lives. And I think that the men should also keep it for the well being of their wives! This is an amazing tradition of the past, but I doubt the young of today could withstand such a commitment. Many young people are taking up the fast….even in groups where the tradition is not prevalent. Young men are fasting with wives…and that is truly amazing. But there is backlash criticism that it is regressive and in keeping with patriarchal, male dominance tendencies. Thanks for your feedback. Bless you.